Turn off your cell phone. Unplug your computer. Put something real on the books in 2019 – live music from the treasure of North County, the CCCBand. 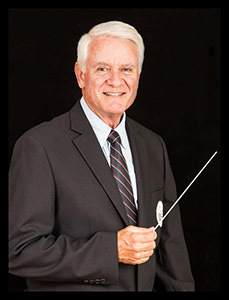 The conductor and music director of the Coastal Communities Concert Band is Tom Cole. 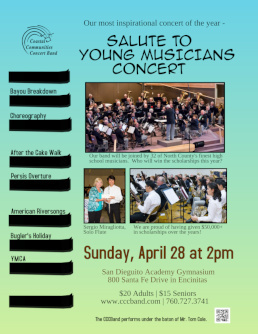 Tom is a highly respected band conductor and clinician and recently retired as band director of Rancho Bernardo High School where he had one of finest band programs in California and the nation. Click “Like” to become a “Fan” and post your comments about our band. Never miss a concert! We email you bimonthly at most, and your email information stays only with us and is never shared with a third party. We’ve entered a new era. We are now one off the first community bands in the US to have our own Mobile Smartphone App. So, if you have an iPhone or an Android phone, you can download or app here. On our mobile app, you’ll be able to check out all the upcoming concert dates, purchase tickets, watch CCCBand videos, read about all the musicians in the band or get exclusive content. You’ll also be able to share your concert experience on Facebook and so much more! Help us usher in the mobile generation! The Coastal Communities Concert Band Foundation is a participant in the Amazon Services LLC Associates Program, an affiliate advertising program designed to provide a means for sites to earn advertising fees by advertising and linking to Amazon.com.